up at 4am..now it's 7..
Well I prayed last night that God would wake me up. I struggle with getting up in the morning esp when I don't have to go to work. I guess I should have prayed more specifically. I woke up at 4 and couldn't get back to sleep. Well I realize God is not Santa. And the fact of the matter is he does answer our prayers. Nathanael helped me last week. He said my bike tires were really low. He repaired my tire, actually put a new one on. My ride to work was much easier than the past few weeks. A tire. That is what the hard work was for. One leaky tire. On my ride I was really thinking about this. When we keep up the "work" in our own lives: daily prayer and reading the Bible, fellowship with God, the trials come easier. Otherwise we are working harder for that "tire" Everything is more work, for that one simple tire. Recently I've felt the call to pray. I have realized that this is of utmost importance, not an afterthought, not a "God please bless this mess I've made"
Friday October 18 has become an important date for our family. Yesterday Nathanael and I had a meeting with the guy who will be our pastor through EMM. He was the final step in the process of approval. In august we had a meeting with Darrel and his wife Sherryl. At that time we were given "homework", told to go home, and pray about our calling. I have to admit this process hasn't been "fun" or easy. There were times I questioned why we even were pursuing it. Last night I had the opportunity to talk to a woman at work about my story of a calling. It renewed my purpose in it. That initial moment where God spoke to me directly hasn't changed. Circumstances have. People have failed, but the calling remains as strong as ever. 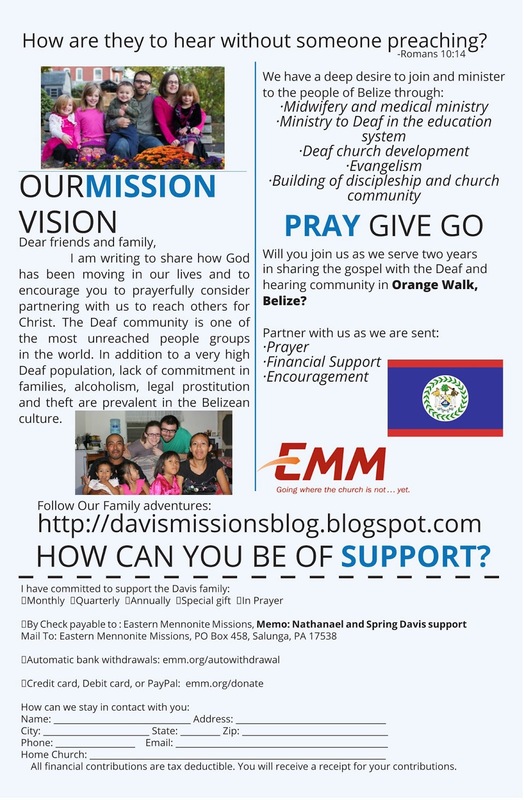 After a conversation with Darrel, he told us we are approved to continue on to the next stage with EMM. Let me state that one again: APPROVED. nothing conditional anymore. And so our journey, which began quite a while ago, has taken a new turn. Things seem more final but I am still very anxious. There is much to do, and per Nancy, Sulmi, and really our goal; we have 9 months to complete fundraising and training. Usually the amount we have to raise takes 12-18 months. I guess we really are starting out expecting God to do awesome things (or for it to take longer for us to get to Belize).